This year marks the 80th anniversary of the PTAR and the 20th year since the last air race was held in Gauteng. In 1997 it was hosted by the Vanderbijl Park Flying Club at its field outside the town. Sadly the club is no more and the runway now forms part of an informal settlement. 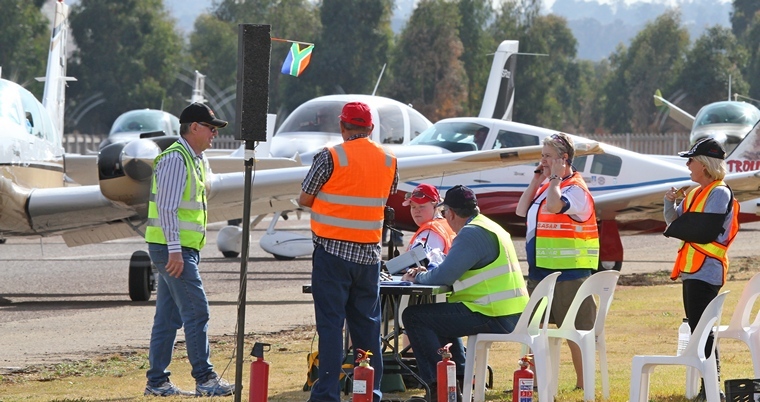 This year's PTAR held in Springs attracted 67 entrants, somewhat down on last year's 89, ascribed perhaps to the proximity to the big controlled airspace areas and the perceived difficulty in this area. Nonetheless, competitors started arriving on Thursday throughout the day, most having landed by 12 pm. This year there were no test flights planned as the new handicapping formula was being applied, this new handicapping system having been applied a by means of a more scientific approach to establishing a reflective best speed of any aircraft. Wits University Aeronautical Engineering department was approached to devise this theoretical formula, which is based on the three dimensional distance flown under the race day atmospheric conditions, and based on historic races flown by individual race aircraft. However, after investigating the university found that they could not devise a better formula as the one submitted by the SAPFA Handicapping Committee. Since the introduction of the Data Logger SAPFA has gathered a large amount of race data on about 340 aircraft and have developed a formula, X=k(k.y-1(1+(y.10-4-0.01))+0.04)-1, that will use the available data that will be applied consistently and fairly, without fear or favour and level the playing field so that each competitor has a reasonable chance of winning. Details regarding the formula were made available well in advance to give competitors the opportunity to use it to calculate their own handicaps either before or at any time during the weekend. In the formula X = handicap in knots, k = the course distance in nautical miles (2017 PTAR, k = 554.94 nm) and y= the best recorded 3D speed in knots. The 3D speed has come from historical data (available from the SAPFA website) gathered by SAPFA and is input (y) in the above formula, and is used to calculate your handicap. The following adjustment will be made by the adjudicators in terms of the PTAR Race Rules and Regulations. If a competitor exceed his or hers 3D speed after a day's racing, the new 3D speed will automatically be entered into the Formula and it will calculate a revised handicap. After the briefing on Thursday afternoon, everybody retired to complete their race plot ready for the 1st day. Friday morning dawned with pristine weather conditions, although the wind was predicted to become a significant factor for the day blowing westerly and increasing in strength to around midday. This would be hampering the slower aircraft as they would be taking longer around the course, which was primarily a triangle in shape with the first leg to Piet Retief, the second shorter leg to Wakkerstroom and the last leg back to Springs. 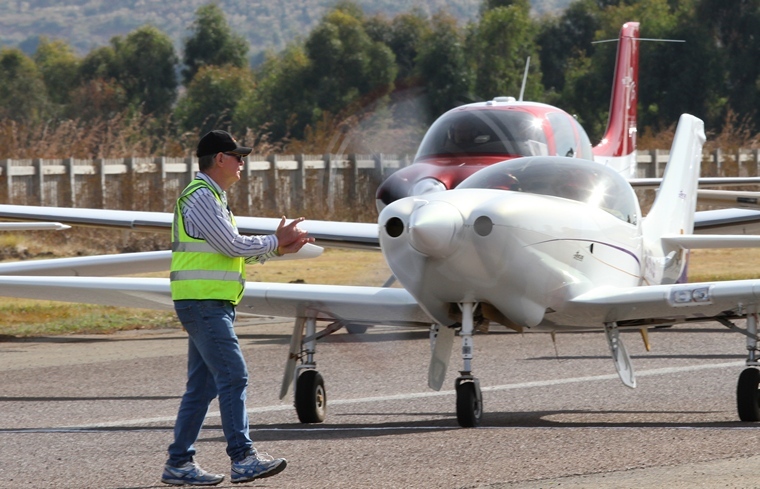 Although an easy navigation course, the terrain around Piet Retief and Wakkerstroom was in the berg area and needed careful flying with the Westerly wind. As it was the flights on day one were marred with a few incidents, the worst being the Beagle Pup being caught out in a berg rotor which could not be outclimbed with impending terrain impact, fortunately the crew survived, some others had technical problems that had either to carry out precautionary landings or divert to other airfields for attention. There was one competitor however that got totally lost and given the analysis of the track shown at the briefing afterwards, was a real hoot to see, especially given the fact that fuel was running low and had to do an outlanding at Majuba power station to find fuel to uplift before finding their way back to Springs. Last year's winners at Bethlehem, Phillip Jacobs and Nico Smith in the Piper Arrow ZU-WAP, Race number 1 in was back to defend their title in what turned contested first leg. However, having almost completed the first leg they unfortunately had a complete loss of power four miles from the field. Race 1 Piper PA-28R-235B Arrow engine failure on return after completion of Leg One. At 10.00 Robin waved Dieter Bock and Dale de Klerk in race #10 Lancair Legacy ZU-DBC with a starting handicap of 218.56 off and the race was on. Dieter and Dale eventually finished in 17th place with an average speed of 224.78 knots. On day one the fastest aircraft started first, one following the other at 30 second intervals. Following them were Mike Howell and Gerhard van der Westhuizen in the Race # 7 Glasair III ZS-WBT at 216.28. The Glasair did not compete in the second leg. Next was the first of the twins, Race #45 the Beech BE58 ZS-KCS off 198.64 crewed by Mario Febbraio and Eric Addison handicapped 198.64 who finished 9th overall. Fourth of the starting line was Race 42 the Cirrus SR22 ZS-JIE crewed by Alex Dyason and Johan van der Hoven with a starting handicap of 186.94. They finished in third place overall. Fifth was Race # 15 the Ravin 500 piloted by Calle Hedberg and navigator Mike Visagie handicapped at 182.45 who finished 36th overall. On Saturday morning the last aircraft to finish leg 1 started in first place followed at an interval determined by the handicap time of the next Saturday's leg was more complicated. Fortunately there were no incidents. The 2nd race day Saturday is the day when the objective is to stagger the flight starts from the slowest to fastest aircraft to achieve a simultaneous finish of the whole field to be over the finish line at exactly 13h00, that is of course if everybody flies a perfect race speed and distance. Weather conditions on day 2 were similar to day one with a Westerly wind increasing during the day, the course this time in the figure of a bow tie with a crossover close to the airfield, with the first bow towards the south and the second bow to the north east. It was an easier course as it had no major altitude changes and mountainous terrain to contend with. The first take-off was around 10h40 and is an interesting spectacle to observe from the ground as some groups of competitors with similar handicaps were taking off within 10 - 15 seconds of each other, quite a sight to see more than 6 aircraft in line behind each other climbing out. As the flights progressed a live tracking screen was set-up in the briefing hangar for some spectators to watch around 6 competitors who had their smartphones recording their flight's progress, particularly interesting was to see when they were closing in to the crossover point and then going outside to see them come past. Although the livetrack is in its infancy and very dependent on good cell reception and fast internet for the ground station, it has promise to give better spectator value. As 13h00 came the first competitor across the line was a Cessna 180 ZS-NEH followed by a Cirrus ZS-PFD, although once the scoring was done, the Cirrus was declared the winner with the C180 second with only 3 seconds separating them. The first 30 aircraft were over the line within the first 10 minutes. For the second day, no incidents were reported, and overall a good race result. However, arriving first does not necessarily means that one is the winner. That decision ultimately rests with the judges who had to scrutinise the logger tracks. The names of were only revealed at a lavish awards ceremony held in a marquee at the field. The PTAR is the premium event South African Power Flying Association event of the year. Unfortunately this year it did not draw the numbers like it did in previous years.